A savory experience for your mouth. 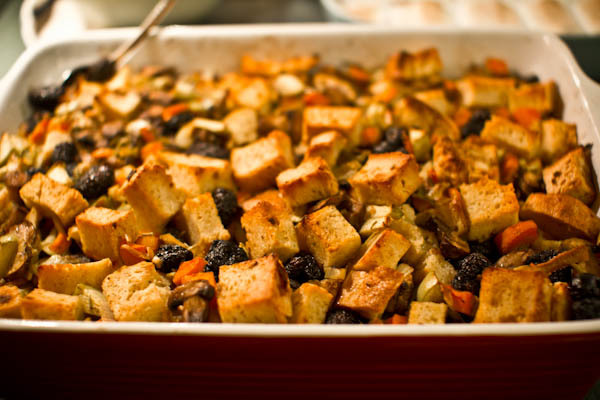 I amped up my traditional stuffing recipe by adding dried fruit and apples and the result is delightful! Can be gluten-free, dairy-free and vegan dependent upon your bread selection. Preheat oven to 350˚. Spray a 9×13 pan with cooking spray. Spread bread cubed in a single layer on two rimmed baking sheets. Bake for 8-10 minutes until toasted and beginning to brown, stirring once halfway through. Place into 9×13 pan. Heat 1 tbsp olive oil in a large skillet over medium heat. Add mushrooms and cook until tender and lightly browned, stirring frequently. Add mushrooms to pan with bread. Add remaining oil and heat on medium-high. Add leeks, carrots and celery. Cook until vegetables are tender, 7-10 minutes. Stir in seasonings and garlic, stirring constantly for 1 minute. Pour into pan with bread and mushrooms. Add dried cherries and apple to pan with bread and vegetables. Stir gently to combine. Pour chicken stock over the top of bread and vegetable mixture. Bread should be moist, not soggy. Cover with foil and refrigerate until the turkey is almost finished baking. Bake covered in 400˚ oven for 20 minutes. Uncover and bake for 10-15 minutes to brown top. 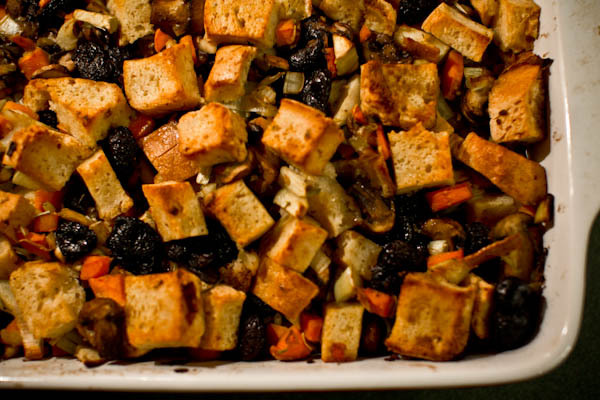 Stuffing can be prepared up to two days in advance. Bring to room temperature before placing in oven, this will take approximately 30-45 minutes. How many servings is this recipie? Can’t wait to try it for thanksgiving! All of the Thanksgiving recipes will serve approximately 10-12 adults.